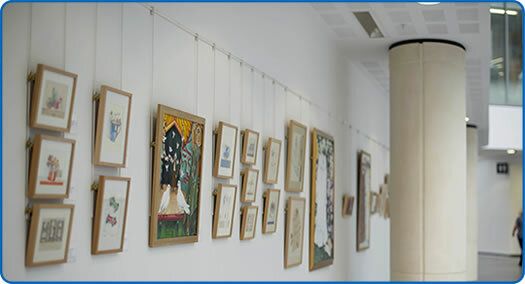 Are you an artist, community group, school or arts organisation who would like to exhibit work with Fresh Arts at Southmead Hospital Bristol? We welcome artworks from a wide range of groups and individuals to be part of our rolling programme of exhibitions. Two of our spaces are managed by artist collectives, one is open for applications from artists and artist groups and one is available for use by schools & local community groups. We want to make it easy for our local community to create high quality exhibitions of their work, so we have a stock of oak frames for schools’ and local groups’ use. The displays are changed three times per year to keep the galleries fresh and exciting for our patients, staff and visitors. We offer local and national artists an opportunity to reach a broad audience with their work, in a high quality display environment. Quality of work – The Fresh Arts programme Quality Statement. We ask that artists read the statement before applying. Please contact us if you think your work meets our criteria and you would like to discuss exhibiting with Fresh Arts at Southmead Hospital, Bristol.